Takin’ it Shep by Shep. Cat got your tongue? I hope not. The four guys and two gals of Sheppard aren’t so tongue tied anymore as “Hold My Tongue” shouts it loud and proud — it’s the #1 song on my chart, up from #2 last week. 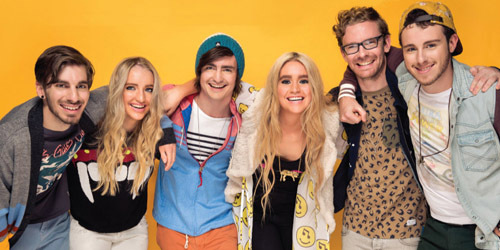 This is the Australian band’s first chart-topper on my survey and second top 40 single following “Let Me Down Easy”, which spent three weeks at #10 during the summer. The last time an act born in Australia held the #1 spot was in 2010 when Daniel Merriweather led for three weeks with “Red”. Coincidentally, in the heat of this Aussie fever, this song debuted on the Hot 100 31 years ago this week down at #79 on its way to #1, so make of that what you will. Soon to be released in a new remix with vocals from Christina Aguilera, “Say Something” by duo A Great Big World is up 23-19 this week. Look for it on iTunes this upcoming Tuesday, the same night the band and Aguilera will perform the song on The Voice. This week’s only debut belongs to British quartet Bastille, who rocket in at #34 with “Of The Night”. Their latest single and third entry is a dark and atmospheric mash-up of two dance hits from the 90’s: 1992’s “Rhythm Is A Dancer” by Snap! (#5, Hot 100) and 1995’s “The Rhythm Of The Night” (#11) by Corona. After a free download period last year, it sees a digital release on All This Bad Blood, due in the United Kingdom in three weeks. With as many as five debuts coming next week, Gary Barlow, Kelly Clarkson and Robbie Williams are all looking to get a piece of the top 40. “Perfume” by Britney Spears is also debuting in the coming week, so stay tuned to see if it lands an instant impact.